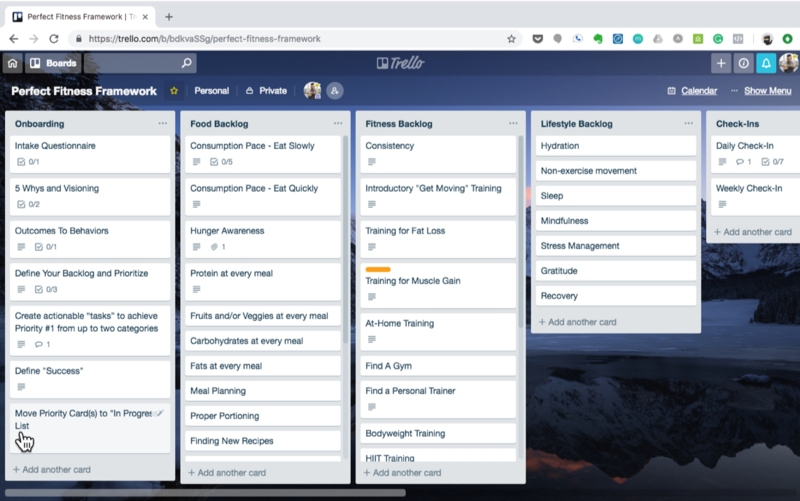 Recently, I connected with Evan Cook, the founder of Head Down Heart Up (HDHU), a fitness and nutrition organization that has “The Perfect Fitness Framework,” which is a program based on Scrum, designed to simplify food and fitness. As we continue to see the use of Scrum outside of IT, I thought it would be great to learn more about what he is doing. As part of the discussion, I interviewed Evan about how he is using Scrum, and I thought it would be great to share this on our Blog. When did you start using Scrum, and why did you choose it as the model for the Perfect Fitness Framework? Evan: I wish I could say I went into this with the intention to use Scrum as the model, but the truth is, this was one of those "a-ha" moments when you make the connection between two seemingly unconnected disciplines. In addition to Fitness and Nutrition Coaching, I’m fortunate to serve two incredible teams as their Scrum Master and Agile Coach at a Fortune 100 company. I’ve worked in the company's IT organization for the last five years, and it was within the previous 18 months the company decided to completely transform the organization around Agile principles and values. The more I dove into learning about Scrum and its practices while I prepared for the Scrum Master role, the more I noticed similarities to how I approached my coaching practice. I credit my background in coaching to a nearly seamless transition into that role. I never liked the all-or-nothing structure of most fitness and nutrition programs: do these workouts and eat these foods and voila, you’ll have the body and life of your dreams. Only, that’s not how life works. That’s not how change works. Scrum and Agile are ultimately about fostering change in a way that creates the most value for the customer or end-user. Waterfall projects rarely work because it doesn’t account for the micro, and sometimes macro changes that happen in the process. Similarly, life has a way of interfering with the best-laid plans, and your fitness and nutrition is no exception. Just like how a Waterfall Project Plan looks good on paper, so do most fitness and nutrition plans. While not as flashy, it’s the small, incremental changes that produce the best results. At the very least, they allow for near immediate feedback. Feedback is the only way to know if something is working and if you spend any time around me you’ll quickly learn my mantra is to do more of what works and less of what doesn’t in a way that works for you. While I had a foundation in place, it wasn't until the beginning of 2018 when I started formally rebuilding my coaching practice around the Scrum model, and the Perfect Fitness Framework was born. What results are users of the Perfect Fitness Framework seeing as compared to traditional "waterfall" based fitness programs? Evan: The use of Scrum as the backbone of my coaching is a response to the fact that most people take a “waterfall” approach to their fitness and nutrition goals. There is all of this upfront planning about what you’ll do for the next 12-16+ weeks, but when we actually get to that part of the plan, expectations rarely meet reality. As they say, life happens. Planning months in advance isn’t very effective. It’s critical we have a sense of direction, yes (compare this to a Product Vision). It’s equally important the journey be flexible. We have to be able to adjust and adapt quickly, and effectively. When I hear the word “agile,” I hear speed, quickness, and nimbleness. I hear communication, collaboration, and accountability. Yes, outcomes may come quicker using the Perfect Fitness Framework (though, not always) and last longer (almost always), but I think of agility as the ability to quickly shift to what’s important right now and in being able to talk about why and how to bring that to life. What you thought would be important in 8 weeks might not be and something you all but wrote off might now be the #1 thing to focus on to help move you forward. Action is everything, and you’re only as good as the insight and information you have that drives that action. Scrum makes it easy to take action on what's most important. Ultimately, the most significant difference I’ve seen is the changes people make and the results they achieve become a part of who they are, not just something they do. Because of that, their results last. After all, once something becomes a part of your identity, it’s no longer just something you do once to achieve a result, it’s something you do daily. Aristotle is often attributed to saying “we are what we repeatedly do.” You can’t change your life without changing who you are or at the very least, whom you think you are. Waterfall is about the “doing.” Agile is about the “becoming.” You don’t “do” Agile, you become it, and Scrum is a means to that ultimate end. Can you share what the Perfect Fitness Framework consists of? Is it software based or do users use physical boards? Walk us through how people use it. Evan: The Perfect Fitness Framework, like Scrum, is intentionally very simple. There’s no set software, physical boards are an option, and this is something that can be done with nothing more than a pen and paper.The tools we use are exercises that ultimately lead to the creation of a “Backlog,” and we use events similar to the Scrum Events to foster an environment of transparency, inspection, and adaption. Those three characteristics are why Scrum creates such a strong foundation in the Perfect Fitness Framework. 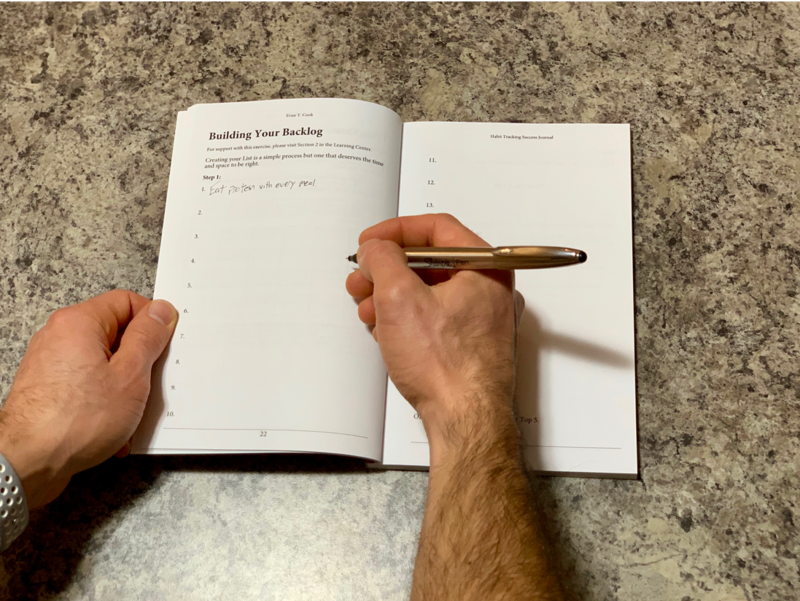 The Backlog might reside within a Fitness and Nutrition Action Plan that I create for my clients, within a Habit Tracking Success Journal which is a self-guided version of my coaching, on a digital tool like Trello, or even on a whiteboard with sticky notes. My clients get to decide the cadence of our “events.” Some love the accountability of a daily check-in that serves as a Daily Scrum. Most clients prefer the weekly check-in that closely resembles a combination of a Sprint Review and Retrospective. Here we determine if we’re “Done” focusing on a particular skill, habit, or behavior and if it’s time to pick up what's next in our backlog. We also inspect our results to see if what we’re doing is working or if it isn’t. Planning is done a little differently. Our cadence isn’t set to a specific time box but rather by sets of 5 Skills, Habits, and Behaviors. Our ultimate goal is a consistent practice of said Skill, Habit, or Behavior, not “completing” it in a set timeframe. Most Skills, Habits, and Behaviors take 2-4 weeks to become proficient. Once we’ve worked through the Top 5, we revisit our Backlog by repeating many of the initial exercises, though quite honestly, most people realize that their Top 5 is more than enough to help them reach their goals. Refinement is done with the goal of taking the “what” we want to do and breaking this out to “how” we’re going to do it. For example, both “go to the gym” and “eat healthy” are far too vague to be actionable. How many times will you go to the gym and when? What will you do once you’re there? What does “eating healthy” look like to you? We want to split these out into smaller “stories” so that over the course of that 2-4 week timeframe we’re getting progressively better each and every day. Anything that feels like it'll take more than a month gets refined further. Ultimately, the core of the Perfect Fitness Framework is prioritization and iteration. It’s about creating an environment in our lives that empowers us to focus on what’s most important. It’s about getting just 1% better and building momentum in our lives. Momentum is one of the most powerful forces in the universe. Remember, an object in motion tends to stay in motion. Prioritization and iteration are your secret weapons to build momentum and protect you from the notion that you have to do everything to get what you want. Yes, if you want to be a healthy, happy, fit person you need to do the things that healthy, happy, fit people do, but you don’t have to do everything all at once. Use the Perfect Fitness Framework to get really good at one thing, the most important thing. Then move on to the next. Keep repeating this process until you’ve not only achieved the results you want, but you’ve become the person you want to be.